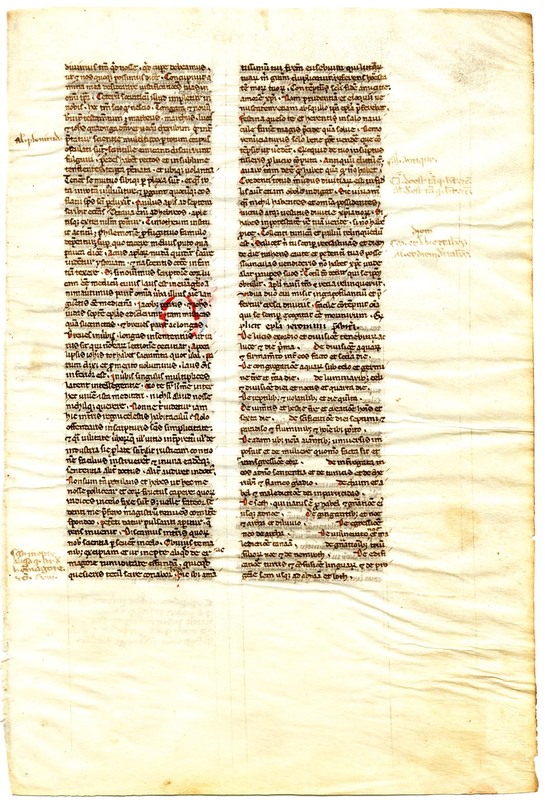 Text: This interesting leaf comes from very early in Ege's Oxford Bible--perhaps this was only the second or third leaf in the manuscript, and it contains prefatory material composed by St. Jerome. 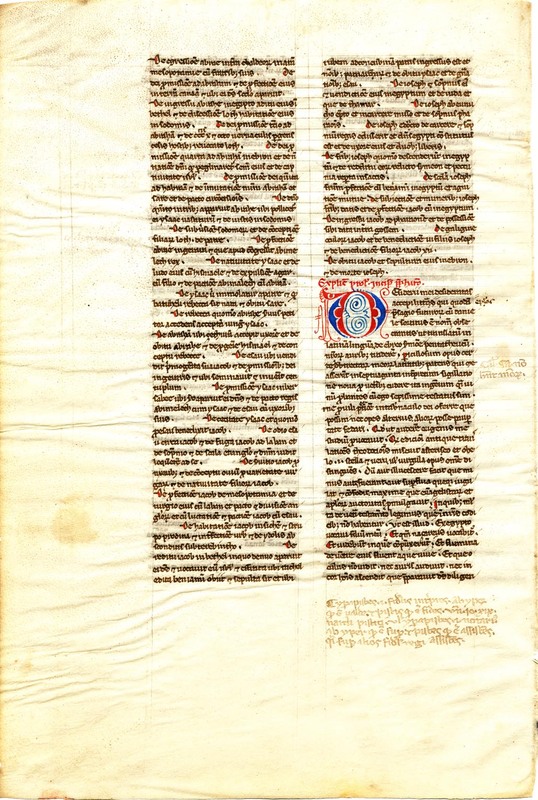 The recto begins in the midst of Chapter 7 of Jerome's Epistola ad Paulinum presbyterum, de omnibus divinae historiae libris, and goes on to contain all of Chapter 8 of that work. At the dark-ink explicit in the middle of the B column of the recto, there begins a table of contents of the Book of Genesis, which extends onto the B column of the verso. After a rubricated explicit, there begins the text of Jerome's Praefatio in Pentateuchum. -tissimum tui fratrem Eusebium, qui litterarum tuarum michi gratiam duplicavit; referens honestatem morum tuorum, contemptum saeculi, fidem amicitiae; amorem Xpisti. Nam prudentiam et eloquii venustatem etiam absque illo ipsa epistola praeferebat. Festina quaeso te; et haerenti in salo naviculae funem magis praescinde quam solve. Nemo renuntiaturus saeculo bene potest vendere, quae contempsit ut venderet. Quicquid in sumptus de tuo tuleris; pro lucro computa. Antiquum dictum est. Avaro deest tam quod habet; quam quod non habet. Credenti totus mundus divitiarum est. Infidelis autem etiam obolo indiget. Sic vivamus quasi nil habentes et omnia possidentes. Victus atque vestitus divine Xpistianorum. Si habes in potestate rem tuam vende; si non habes proice. Tollenti tunicam; et pallium relinquendum est. Nisi scilicet tu semper recrastinans et diem de die trahens caute et pedetemptim tuas possessiunculas vendideris; non habet Xpistus unde alat pauperes suos. Totum Deo dedit; qui se obtulit. Apostoli tantum navem et retia reliquerunt; vidua duo aera mittit in gazophilatium; et praefertur Croesi divitiis. Facile contempnit omnia; qui se semper cogitat esse moriturum.